4 Bedroom Semi Detached House For Sale in Stockport for Asking Price £425,000. 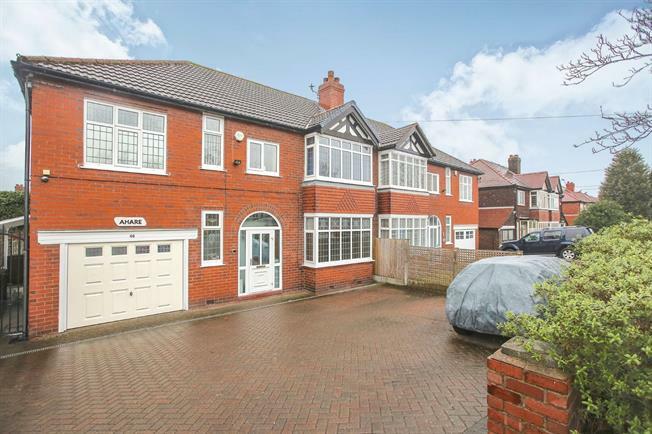 This Grand Traditional Style Bay Fronted Semi Detached Home boasts accommodation of an excellent proportion with Four Double Bedrooms (and scope to add a fifth bedroom off the landing). This home has all the necessary ingredients for great family accommodation, including Three Separate Reception Rooms plus a Conservatory, an attached garage, a pleasantly bright and airy landing and, of course, the four double bedrooms. In brief, the accommodation comprises porch, welcoming entrance hallway, lounge, dining room, conservatory, morning room/family room, kitchen, attached garage. To the first floor is a landing open to a study area, four bedrooms and a shower room. Externally to the front of the home is a large block paved driveway with space for several cars. Timber fencing to both sides and low level brick wall to the front. The rear garden is also generous in size and is laid mainly to lawn. Stepping out of the conservatory onto a paved patio and then another step down to a second paved patio, levelled with the lawn. Raised borders have been well maintained by the current owner. A good size shed is disguised in the bottom corner of the garden. To the borders are a mixture of post panelled fencing and hedges. A wrought iron gate allows access down the side of the home, with canopy cover, leading to the front. Double glazed door and quarry tiled flooring. Access to the home is via a timber door into the hallway. Two wall lights. Attractive, raised and fielded Oak panelling featured in the entrance hallway. Plate rack. Coving. Radiator. Good size cloak room with window to the front aspect. Double glazed bay window. Ceiling coving and picture rail. Two radiators and television point. Double glazed half bay with double doors leading through to the conservatory. Double glazed window. Ceiling light and three wall lights. Two radiators. Electric fire. Ceiling coving and picture rail. Television point. Double glazed window. Laminate flooring. Door to pantry with built in shelving. Radiator. Television point. Fitted with a range of wall, drawer and base units. Roll top work surfaces incorporate a one and a half bowl sink and drainer. Integrated double oven and gas hob with stainless steel extractor hood over. Spaces for a washing machine, dishwasher and fridge. Quarry tiled flooring. Part tiled walls. Double glazed window to the rear. Double glazed door to the side and door to the garage. Up and over garage door. Wall mounted boilers for the gas and hot water. Frosted window to the side aspect. Shelving and space for additional fridge freezer. A spindle balustrade staircase from the hallway leads up to the spacious first floor landing. An initial landing gives access to third and forth bedrooms and then the stairs turn up to the main landing where all the other rooms can be accessed. Landing with double glazed frosted window to the front elevation and open to a study area with another double glazed window to the front elevation. (The partitioned study measures 2.10m x 1.05m.) Ceiling coving and picture rail. Radiator. Loft access point to insulated and boarded loft (boarded up to the eaves). Double glazed window to the rear elevation. Fitted wardrobes to three walls. Radiator. Double glazed bay window to the front elevation. Built in furniture including wardrobe, drawer unit, desk and shelving. Ceiling coving. Radiator. Telephone point. Television point. Double glazed windows to the front and side elevations. Fitted cupboards with hanging space for clothes. Radiator. Telephone point. Television point. Double glazed window to the rear elevation. Fitted wardrobes to two walls, shelves, desk and drawers. Radiator. Television point. Fitted with a walk in shower cubicle and electric shower over and shelving. Wall unit with his and hers circular sinks and mirrors with storage below. Low level WC. Bidet. Laminate tiled flooring. Part tiled walls. Storage cupboard with shelving. Radiator. Double glazed frosted window to the rear elevation.